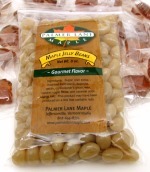 Pure maple candy is made from pure maple syrup, harvested in northern Vermont. When individually boxed this large 1.5 oz. maple leaf shaped candy is enough candy for two! 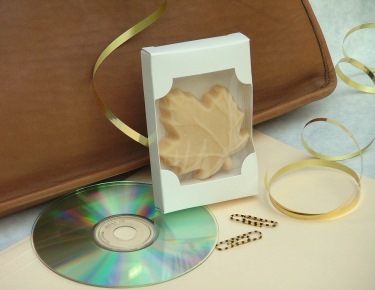 As one of our most popular corporate gift items, the maple leaf candy is a wonderful treat to break up the day, or a perfect Thank You to hard working employees. Best of all, it's one of the most affordable corporate gift ideas available, that you know will be appreciated! 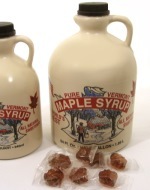 After all, it's Vermont maple candy. The Ribbon & Custom Tag - This individually boxed maple candy is wrapped with a 3/8" wide orange ribbon and includes our custom tag, on which is printed, "A Vermont Gift. Just For You." Other ribbon colors are available, simply give us a call. There's also an orange maple leaf printed on the front as well. Inside the tag we'll also carefully hand-write your gift message.